Image of musicians at Old Bethpage Village Restoration. 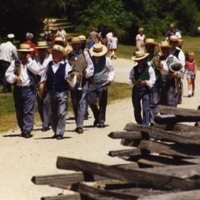 A photograph taken at the Old Bethpage Village Restoration of musicians walking and holding their instruments. The musicians are wearing white shirts, dark trousers, and straw hats. Image of man playing fiddle at the Long Island Fair. 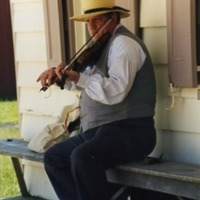 A photograph of a man sitting on a bench playing the fiddle. He is wearing a straw hat with a dark band, white shirt, grey vest, and dark trousers. This image was taken at the Old Bethpage Village Restoration during the Long Island Fair. 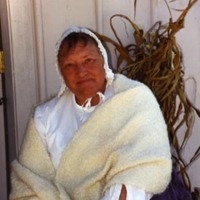 A photograph of a woman in a traditional white dress and head covering. This picture was taken at the Old Bethpage Village Restoration during the Long Island Fair.